As most people visiting this site will know, Dinky made far more examples of the model Duple Roadmaster than Duple ever managed to make of the real thing. Most of the real ones went to Standerwick and, so far as I am aware, there are no survivors from that batch. There area few others about, however, and I captured this one, LOE 300 on Royal Tiger PSU1/15 chassis, during the Fleetwood Tram Sunday event on 15 July. The PSV Circle volume on preserved buses shows her to have started life in 1951 with Jackson of Castle Bromwich. She’s now in the care of Walsh (Belle Vue Coaches) in the Manchester area and may or may not show RSK 615 as the registration. "Not" in this view! I’m sure someone out there can answer this, but I’ve only ever seen the Roadmaster on a Royal Tiger chassis. Were they ever fitted to other makes? RSK 615 isn’t assigned to any vehicle at present. To clarify the note above, she shows Belle Vue Coaches on the back panel, but PSVC shows her as with Walsh. KWO 37 Guy Arab UF – on this site, Pete. David, Thank you for that. I can see some resemblance, but my experience of the body design – Standerwick and Dinky Toys, of course, plus this one – shows several differences. Is it, perhaps, a Mk1 and a Mk2, or other modification, in the way the Seagulls had variations and "Mk" numbers during their production? SK is a Caithness (Inverness) registration mark, so if that’s the original number, could it have started life with the SMT group ‘Highland Scottish’ as it later became? 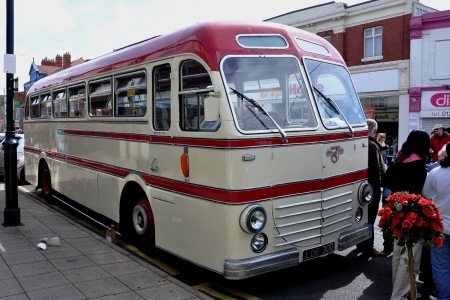 I saw this lovely machine at the Leyland event, but how much nicer would it look if repainted into the dark blue with a red roof livery it wore while with its main owner, South Notts of Gotham, who bought it from Jackson at a fairly early stage in its working career? Did any other Roadmasters survive to the present day? Two of these coaches survive. The other is MAL 310, a South Notts PSU1/11 new in 1951. South Notts also owned LOE 300 for a time. Livery makes such a difference, Pete – as does the fact that the Guy is photographed in black and white and the Leyland is, literally, in glorious colour. Lighter shades tend to flatter – which is no doubt why large operators of this era used "reverse" livery for coaches. The registration number RSK 615 is almost certainly an age related DVLA allocation thus inferring that the LOE 300 registration has or may have been lost at some stage. If it is being driven wearing LOE 300 then hopefully the number has been regained replacing the age related one. I wonder how many of these Jackson of Castle Bromich had, because South Notts purchased two of them, LOE 300 and LOE 900, both in 1957. As Neville says, South Notts were the main operator, having obtained around thirteen years service out of them. Together with their own MAL 310 purchased new and MRR 974 with Leyland bus body, it was quite an impressive fleet of Royal Tigers for a small independent! (i) Livery (ii) Mouldings (iii) Position of emergency door (central on Guy) partly causing (iv) different windows (pairs on Leyland put two singles in middle of Guy) Drop ventilators on Guy and Hoppers on Leyland. Mouldings include front panel on Leyland for spare wheel. Question for everyone. Hoppers? How common was this in 1950. Still the same body, though. Similar difference could be seen on other bodies, including later Duples – in particular between bodies on different chassis. 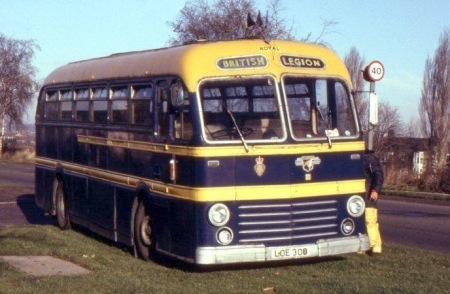 As Chris B says, LOE300 spent approx 13 years with South Notts; it then passed to the British Legion (later Royal British Legion) at Gotham who kept it for many more years. My photo shows it on Queens Drive, Nottingham in 1988/9, towards the end of its time with them. How nice to see it preserved and active again. Good bit of parking or pioneering low-step access for the old lads?! More seriously, I thought the (unavoidably) off-centre Leyland badge had been added as a restoration trimming, but apparently not. Now that’s a classy livery, well suited to the beading. Presumably this was is South Notts colours? Another unique point about the South Notts trio of Roadmasters is that the one they bought new, MAL 310 was 7ft 6in wide, whereas these two were 8ft wide. Regarding MAL 310 being a 7ft 6in wide vehicle (and a bus rather than a coach) – this probably has to do with the routes it was planned for. I don’t ever remember seeing single deckers on the Nottingham – Gotham – Loughborough main line service. Single deckers operated the Nottingham – Kegworth village service with quite a few narrow roads and tight bends. Most were short workings to Barton in Fabis or Thrumpton, and the others included or omitted West Leake and/or Kingston on Soar according to market day, the state of the moon, and whether there was an R in the month – a typical rural bus service of the 50s. From memory, I think it was previously run with conductor operated half-cabs. There’s a nice colour shot of LOE 300 in South Notts livery in Malcolm Keeley’s excellent book "Midland Red Days". I didn’t know about it’s time with the British Legion, so thanks for that photograph – she looks rather nice in blue and yellow! Also thanks to Philip Lamb for reminding me that MAL still exists. My personal favourite livery on this type was that of Bamber Bridge MS who had two of them in red and black, one a narrow 7 ft 6 in, the other an 8ft wide version. It’s about time a diecast manufacturer tackled this one again – it’s been a long time since the 1/72 scale Dinky Toy and there are lots of good liveries available even though it was a comparatively rare prototype. Some interesting thoughts from Stephen. There was an oddity reported on the BBC news channel several weeks ago about a market day service in the Milton Keynes area. It operates only on the FIFTH Tuesday in the month, so maybe three or four times a year. Why, the reporter was asking, not EVERY Tuesday? In the Nottingham and Gotham area, I’d be surprised if the mischief makers among the local bus fans did not spend time amending the signs to BARTON IS FAB . . . And Thrumpton, that’s where the fire brigade in the children’s television show was based, wasn’t it? There’s also a train that goes only one way (I believe from Stockport to Stalybridge) and doesn’t return. I think that is only when there’s a Q in the month as well! Alan Townsin’s Duple book confirms that the Guy had a later version of the Roadmaster body than LOE 300, after what he calls "some tidying up". The hopper windows were standard on the early models, later reverting to the more usual full-drop type seen on the Guy. Red & White Group were the biggest Roadmaster customer, the parent company taking 1 Leyland and 14 Guys, with a further 7 Guys for the United Welsh fleet. South Notts own Royal Tiger/Duple Roadmaster (fleet number 42, MAL 310) had 45 seats. This was one more than the Royal Tiger with the Leyland bus body (fleet number 45, MRR 974) that seated 44 due to the emergency exit being in the rear wall of the body. The Royal Tiger badge was fixed in the centre of the front panels on 42, rather than offset to the nearside as with 63 (LOE 900) and 64 (LOE 300). Numbers 63 & 64 both seated 41 passengers. Sorry, Neville – South Notts painted the roof maroon on their buses. Michael, I lived in Nottingham for several years and can assure you that South Notts COACHES used to have a red roof. You’re thinking of their double-decker buses which did indeed carry maroon as their top colour. The red roof on coaches seems to have been abandoned on new vehicles or repaints after about 1960, but the maroon roof on ‘deckers continued until the time of the NCT take-over. Thanks Neville for your info on South Notts coach livery pre circa 1960. I’m a ‘native’ of Nottingham and we moved to Clifton in 1953 (when I was three) so over the years I’ve been very familiar with South Notts buses. Certainly South Notts double deckers had maroon tops and wings and initially also had cream lower deck window surrounds but, from my memory, this was soon dropped and blue window surrounds with a cream cant rail and waist rail (depending on whether the vehicle concerned had a waist rail) adopted instead. My memories of South Notts single deck buses (principally the Royal Tiger bus, known as ‘the coffin’) is that these had maroon tops also. I have to say that these are memories from age nine/ten when I started to take a ‘more informed view’ on buses. On the question of the ‘Roadmasters’ my memories are of them with maroon tops, as are my memories of the Bedford OBs and the Leyland PS1/Duple ‘A’ type, which latterly became a snow plough. Later coaches, such as the Bedford SBs and VAMs had a livery incorporating two shades of blue. By the way keep up the good work with the ‘Independents’ series of books. I look forward to treating myself to a copy of the North Wales volume. Thanks for the kind words, Michael. On the South Notts front you’ve made me doubt myself enough to look through a few picture books to check the coach livery. As well as the previously mentioned shot of LOE 300 in Malcolm Keeley’s book (definitely a bright red top!) I’ve also found two shots of South Notts OB/Duple Vistas with the red roof. It’s a pity that they didn’t continue with this livery variation into the 1960s/70s – by the time I lived in Nottingham the coaches were all-over blue which did them no favours. During 1934 both Barton and South Notts, as associated companies, introduced maroon roofs wings to all their vehicles as a form of corporate identity. Barton having held a 50% share in South Notts since 1929. Maroon was replaced by a light shade of blue on single deckers during 1961 and with the repainting of 117 in 1986 to celebrate 60 years of operation the maroon was dropped, but retaining indigo and cream as the original livery. This was so well received it was decided to standardize this on their double deckers and several were so treated. Royal Tiger No.42 MAL 310 was a dual purpose vehicle, not a bus and was used on private hire and often hired to Barton for their express services. The two ex Jackson Royal Tigers in fact stood in Barton’s Chilwell garage yard for several months and at least one (No.64 LOE 300) ran in service with South Notts in Jackson’s green/grey livery. I was surprised to read in Neville Mercer’s post (above) that of the two Roadmasters with Bamber Bridge Motor Service one was 7’6" wide and the other 8′, since they were both from the same batch (of three?) new to Scout Motor Services, and it has always been my understanding that the entire batch were 7’6". Any more bids? This bus is part of our vintage collection at BelleVue Manchester Ltd.
Any questions you may have I can forward on to The Walsh Bros.
Kenny Walsh is the maintenance Director at BelleVue and he is one half of the Walsh Bros who perform restorations on a variety of classics. The South Notts Worldmasters had maroon tops. I went on one to Dudley Zoo on a school trip – my first solo outing. It was similar to Barton’s maroon as there had always been connections between the two companies. They often did the Saturday services to Gotham and Thrumpton etc from Huntingdon St bus station as well as private hire and duplicates. P54 Malcolm Keeley – Midland Red Days does indeed show LOE 300 with a maroon roof exactly the same as the two South Notts Leyland buses behind. This is probably a Saturday with the Leyland PDs doing a short working to Gotham and the regular service to Loughborough (18-30 departures?). The Thrumpton bus would turn off before Gotham and was usually lightly loaded. Alan Oxley’s South Notts book (1985) is one of my cherished possessions and I would highly recommend it if you can get hold of a copy. Oxford Diecast models intend to make a 1/76th scale model of a Worldmaster in Belle Vue Coaches livery-this one? More details will emerge. David, hate to be pedantic but these are Duple ROADmasters, not Worldmasters. Worldmaster was a brand-name used by Leyland for export versions of their Royal Tiger chassis. Also, while I accept that most South Notts vehicles had maroon roof trim, nobody has addressed the issue of bright red being shown in various published photographs detailed above. I’m aware of the "false colour" which many early types of slide film produced (as is anybody who has bought a book about Ribble!) but the examples given are beyond that. If the colours in the photo’s mentioned are wrong then I suspect that they were altered during production of the books in question. Anybody got any thoughts? That is a valid point, Neville. Not only did different makes of colour film, slide and negative, give greatly varying results, often exacerbated by sloppy laboratory processing, but we now exist in an age of Photoshop and similar computer programs that allow image modification to a degree way beyond the old darkroom techniques. I confess to using the modern methods to get a reasonable result from my elderly slides, and I very much doubt if most published pictures are truly accurate in colour rendition. One does try to get it right, but, perhaps, our increasingly high mileage memories are probably not the best judges of the original liveries. One would really need a paint chart to match the most important colours of the original scheme for a true result. To answer my own query (11/10/12) it would appear that the three Scout Roadmasters were a mixture of 7’6" and 8’0". BLOTW has DRN 355 as 7’6" and DRN 356/7 as 8’0", but the Peter Gould fleetlist gives DRN 357 as 7’6". All the available evidence indicates that the Peter Gould version is correct, if this is the case then the two which went to BBMS were indeed one of each width. In respect of three Leyland-bodied PD2s new to Scout at much the same time (DRN 364-6), Peter Gould has the first two as 8’0" wide and the third as 7’6". BLOTW gives them all as 8’0", but given the mixture of Roadmaster widths I suppose it’s quite possible that the PD2s were mixed width also. Yes, colour films of the era each had their own characteristics: principally, Kodachrome (perhaps the most widely-used colour films at the time) produced vivid representations of reds. Other films were more subdued (and perhaps more realistic). Maroon appearing as bright red: I can believe it! "SK" was indeed a Caithness CC registration originally, but with so few registrations issued by this authority, registration marks BSK to YSK were allocated by DVLA to various VROs throughout UK for "age-related" re-registrations between 3/90 and 3/92.